This Chamomile Pear Elderflower Martini is an elegant cocktail, but be careful it goes down so easy! Post may contain affiliate links. 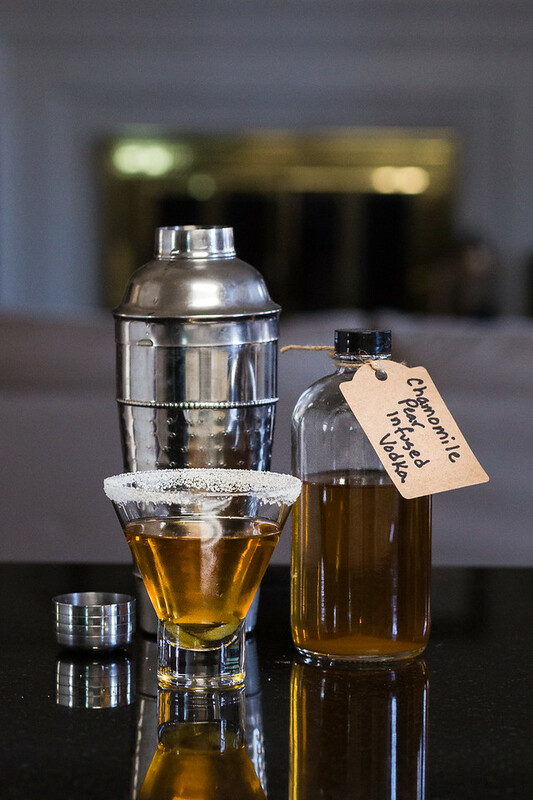 Remember the Chamomile-Pear Infused Vodka that I made last week? Well, for it’s debut in a cocktail I wanted something that would allow it’s delicate flavor to shine. What better way to shine than in a martini? I’m all for a drink that is 100% alcohol – no silly simple syrups or club soda to come between you and your alcohol! 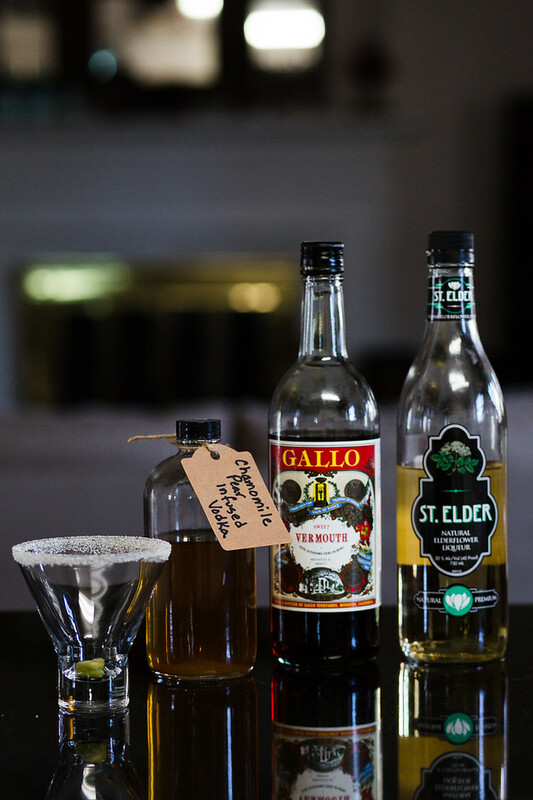 For this martini, I decided that Gallo Sweet Vermouth and my favorite St. Elder Elderflower liqueur would complement the floral fruity vodka. It did!! This was so good!! It was delicate and elegant. A little too easy sipping – I could have drank 3 or 4 of these and never batted an eye. That is until, I had to pick myself up off the floor. On a side note, I love martinis. I understand that a martini is technically gin or vodka with vermouth. But in this day and age of cocktail exploration and explosion, creative license is allowed and appreciated. For this cocktail, I used my infused vodka, a little sweet vermouth and elderflower liqueur. I garnished it with a pear twist – made oh so easy with my new Channel Knife – Wusthof and rimmed Libbey Cosmopolitan Cocktail/Martini Glass (similar) with sugar. By the way, I love stemless martini glasses, the last thing I need while drinking a martini is a top heavy glass. Wet the rim of the glass with a little bit of the chamomile pear vodka and dip into sugar to rim. 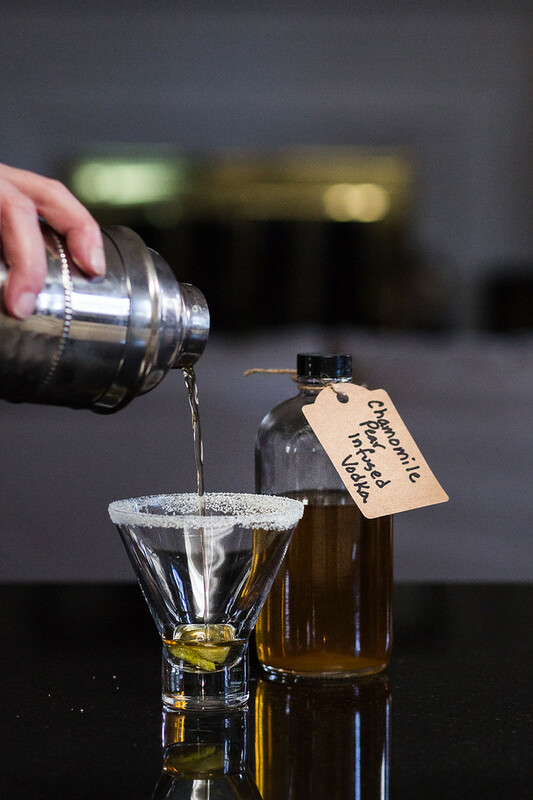 In a cocktail shaker filled halfway with ice, add the chamomile pear vodka, elderflower liqueur, and vermouth. Shake for about 10-15 seconds and strain into glass. Garnish with pear twist. I just bought some elderflower liqueur for the first time recently, so I’m eager to try it in this recipe. Thanks for this great cocktail idea! Sounds like an amazing cocktail, Pam! Elderflower liqueur has been at the top of my must try drinks for a very long time. This drink sounds amazing and looks very mysterious. I’m all in! Totally need a cocktail right now and this looks perfect! Cheers! I need to find that liquor looks delicious, Thanks for sharing with Hearth and soul blog hop, pinning and tweeting. Our favorite bar makes a cocktail that has chamomile grappa in it. First time I’d ever tasted chamomile outside of sipping tea and hoping it puts me to sleep. Delicious! I bet it’s fantastic with pear. And I looove those glasses, too. Stems are so 2014. Thanks for bringing this to #SaucySaturdays, Pam.